Varec brand offers structural and environmental protection devices for low-pressure storage tanks throughout the oil and gas, chemical, petrochemical, and wastewater industries. Choice of vent to atmosphere or pipe away models. Modular design provides flexibility of field installation and allows easy reconfiguration, repair or on-site upgrading. Oversized pressure and vacuum ports provide maximum flow capacity. Easily removable hood and cover for inspection and maintenance. Seat rings are both interchangeable and field replaceable. Protective screens at pressure and vacuum ports prevent entrance of foreign matter. Outlet adapter on the 2020B Series is one pipe size larger than the valve inlet flange to optimize flow capacity. Zero product loss when combined with a vapor recovery system. Replaceable and interchangeable pressure and vacuum seat rings. ‘All-weather’ non-frosting and ice-resistant coating option available for valve seats and guides. Extended service options available for high temperature and chemical applications. Available in emergency pressure only and emergency pressure and vacuum relief models. Cast metal cover provides added strength and extended life. Hinged cover provides a fixed pivot point, ensures proper reseating and added safety. Cover cannot separate from the base. Easily lifted open to provide a large, unobstructed passage for easy tank access. 221PV incorporates a spring loaded vacuum relief valve integral to the cover assembly. Weather hood and screen provided for protection. Non-metallic seat insert on the pallet minimizes leakage. Durable reinforced fabric diaphragm type pressure side seating surface backed by compressible, cellular non-metallic pads for added cushion and reduced leakage. Optional materials available to suit most chemical applications. The Whessoe - Varec Vapour Control range of Floating suction units cover a wide range of sizes and materials to satisfy all the requirements of the liquid storage industry, especially aviation fuel storage. he net free area through all Varec Flame Arrester banks is three to four times the unit pipe size. This design reduces surface friction, therefore, optimizing flow capacity and minimizing pressure drop. The large surface area of the bank also improves heat dissipation. The tie rod bolts are removed and the remaining jackscrews expanded. This extends the end housings allowing the bank assembly to be easily removed. A handle is provided for easy handling. 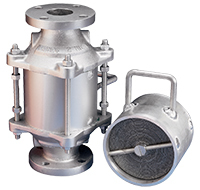 The bank element can be quickly inspected or cleaned and replaced between the end housings. Corrosion resistant 356 HT aluminum construction as standard. Choice of NBR, PTFE and FKM seat inserts. Lockdown device allows for a gas-tight seal up to 3 psig (20.7 kPa). Ergonomically friendly handwheel with padlock feature to prevent unauthorized tank access. 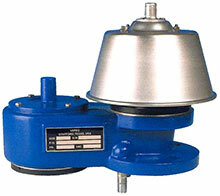 Safety foot pedal frees operator’s hands while gauging or sampling the tank contents. Once open, the cover can remain open for ease of use. Optional steel base available for welding to the tank roof. 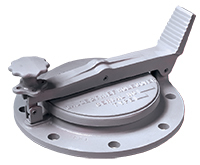 ‘Tite seal’ diaphragm design ensures minimum vapor leakage losses to 1 CFH at 90% of setting. Durable PTFE seal backed by a non-asbestos cushion disc for added resiliency and reduced leakage. 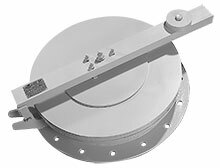 PTFE diaphragm protects the cushion disc from direct contact with tank vapors in chemical and low temperature applications. Carbon steel units have steel bases with a welded and machined stainless steel tip on the nozzle perimeter to ensure a corrosion resistant seating surface. Optional stainless steel bases for chemical and low temperature applications. Flange mounting dimensions conform to either API 650 or ANSI 150#. Optional vacuum valve available in cover.